How could I forget those? Well, I guess it’s because while I often see them in the supermarket I rarely buy them for myself but eat some of it every time we visit my BF’s mother. But anyway. I will buy some after I come back from this long weekend to take proper pictures, as those are pictures I found on the web (baad wererabbit, baaaad!). Messmör (“whey butter”) and Mesost (“whey cheese”) are products made from whey, the part of the milk that’s left over after you take all the good stuff out of it when making cheese. Sound weird? It gets weirder. Since it is made from leftovers, it is not very fatty (about 5,5g fat per 100g “butter” according to the labels) but it is very sweet and contains a lot of milk sugars, calcium and iron. It is supposedly very healthy and if you get to know it as a kid, you will love it. Most of it is made in Norway, and it can be made from cow, sheep or goatmilk, although I suspect the original is supposed to be from goat milk. You buy the cheese in blocks and the butter in small containers. My verdict? Messmör is a little too weird for me. It’s very sweet but has no interesting taste or zest that would make me take to it better. Mesost, on the other hand, is just weird enough for me. I love it! Now take this with a grain of salt and let me explain the taste before you rush to buy some: It tastes like sweet goat cheese. 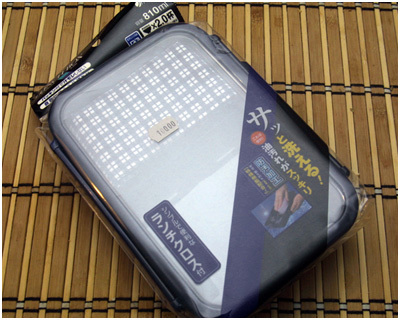 The texture is soft and sticky, a bit crumbly and reluctant to be spread, so still very much a cheese. But the sweet-and-sour mixture together with the zesty taste is actually very nice. It fits best on lightly toasted bread with some butter (if you need to have that fat after all!). 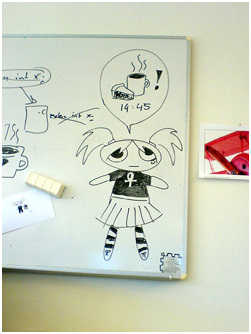 On a slightly different note, look what I found during my image search! It’s a Wererabbits Wensleydale cheese! Anyone know where I can get my paws on one of those? PS: I apologize for the images outside this post being down this weekend. We somehow managed to unplug the circuit for the Modem our server is connected to during shutting down for the weekend. They’ll be up again Monday or early Tuesday! 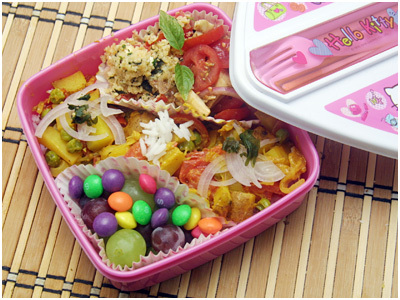 Bento #97 – Fear the Ducky! There’s probably only one person in the community who will get this, but this week’s bentochallenge is “My favourite song” and since I have a weird music taste I took my favourite song in a very special aspect – DDR! You see, I have this DDR game called “In The Groove” that came with my dancemat. I like it a lot better than the original DDR, actually. 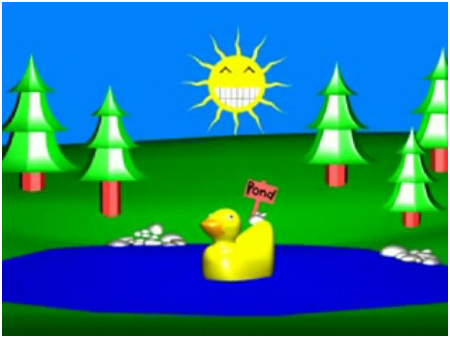 And in there is a song called “Xuxa” whose video features a appearing and disappearing rubber ducky, a pond with the label “POND” next to it for some reason and a smiling sun. It’s really cute and incredibly much fun to dance to! We’ll see if it gets guessed at all! 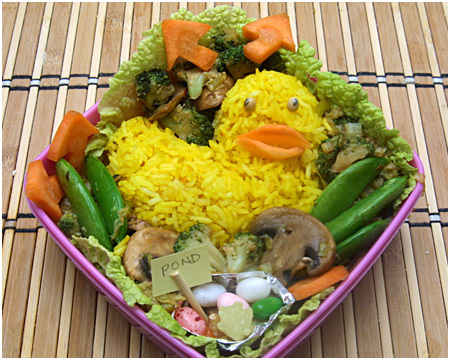 The yellow rice “rubber ducky” was originally colored with saffron, but since it didn’t get yellow enough I added turmeric in the end. It got a lovely rubberducky yellow, don’t you think? The negative aspect was though that it was very un-sticky afterwards. Hrm. You can see how the ducky crumbles where I stuck the parts together… definitely need more experimenting with different rice sorts for that. Around the ducky are stirfried broccoli, chinese cabbage, leek, sugar snaps and champignons stirfried with ginger, chili, garlic, limeleaf, soy and mirin. Mmm limeleaf. I don’t need any other flavouring! Why didn’t I get a pack of those before??? Then there is a deco of chinese cabage, carrot “DDR arrows” and in the silver foil cup are jelly beans, walnuts and kompeitou for dessert. I wanted Skittles but the last packet I had left had only red and orange skittles left! Can’t have a red and orange pond now, can I? On the other hand, having a free side container all of a sudden means I could put something more colourful in there, and the box needed any colour it could get! The big compartment holds potato wedges separating oven-baked breaded mushrooms and fish (my dictionary says it’s called plaice), and a sauce kitty with Hollandaise. 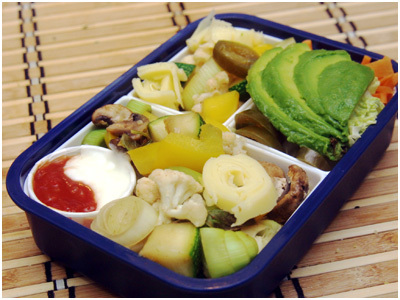 The small compartment on the top holds red and green grapes and a quick mayonaise salad containing chopped carrots, apple, leek and corn. 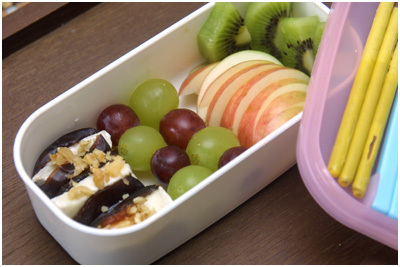 The small compartment on the bottom holds mozarella, tomatoes and basil leaves. This is after something I tasted in a restaurant once, and had to try at home. The original recipe used fish, but – vegetarian friends rejoice! – the mushrooms tasted much, much better even! It was just regular champignons but they tasted amazing. I think eggplant would also fit it rather well. It’s rather simple as well. For the marinade: Dark soy sauce, a spoon of honey dissolved in it, crushed ginger and garlic. Marinate (or if you want to save time, cook the stuff in it for a bit). Bread with flour, salted scrambled egg and milk, and crispy breadcrumbs with sesame seeds mixed in. 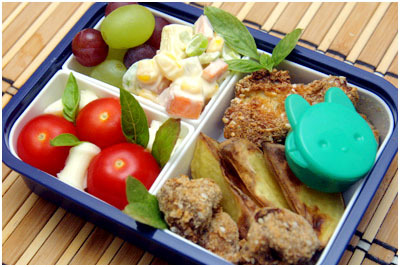 Stuffed dates (recipe courtesy of The Daily Tiffin), grape skewers, apple and kiwi slices, and pocky in the lid. I bought a male box there this time, for the same price, and it’s HUGE! I wanted a slightly bigger one but this one is amazing. 810ml! Maybe if I’m REALLY hungry someday… else my BF is going to use it. Apologies for the bad picture, the camera didn’t cooperate without a flash. I lived in Sweden for a few years now and am still discovering weird new foodstuff those Scandinavians have! So I figured I’ll have to introduce a new category: “Weird Swedish Food” for whenever I stumble across some. Today’s new discovery is something I saw when I first came to Sweden a long time ago, when all food was still weird to me. So I forgot until now, when I mentioned something about rosehips to my boyfriend (I believe I asked if you can do the same things to the big fruits of the garden-hedgeroses – which also grow wild here, weirdly – as you do to the small wild ones). He suggested that I should try some “Nyponsoppa”, and being the sucker for weird exotic food that I am, of course we did. 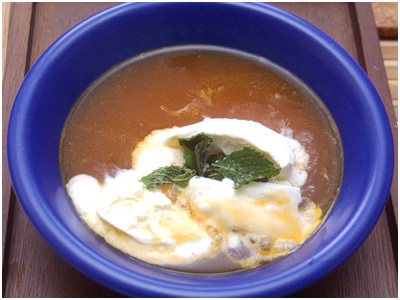 Nyponsoppa is a sweet, soup-like stuff made from the pulp of rosehips. It is eaten warm with vanilla icecream (according to the BF, anyway) and sometimes little almond biscuits. Since it was warm (and the icecream very unwilling) the picture didn’t come out so well. I added a few mint leaves since I figured they might fit the taste well (I was right) for color contrast. It smells – weird. Sour, somehow. *wrinkles nose* But it actually tastes a lot sweeter, and has the aroma of rosehip berries. I missed having some nuts or those biscuits though – it was way too souplike for my tastes, especially when it had melted all the icecream. The taste is quite nice though – although I think I would prefer it to be a bit thicker so I can use it as marmelade instead. It seems like it should be a great comfort food having just a bowl of it with some buttered bread. 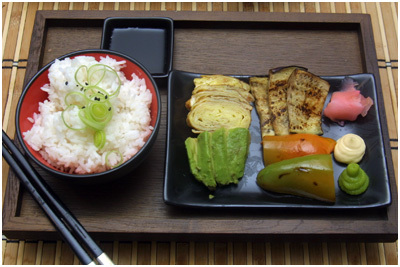 Vegetarian sashimi – Tamagoyaki, avocado, fried and vinegared bell pepper and fried eggplant, pickled ginger rose with wasabi petals, fishy with soy sauce, rice and nori/bell pepper decoration. It may get image heavy. You have been warned. First, I felt the need to make sushi today. But Tuesday is also Gym day! So when I had boiled the rice (It’s longgrained jasmine rice – mea culpa: I forgot to buy white shortgrained rice and didn’t want to substitute brown rice or arborio rice because I needed a white background – see below!) I didn’t feel like standing for another half an hour making nigiri. Ouch! 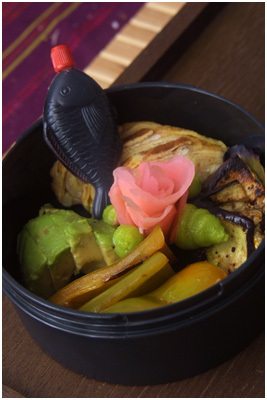 So I decided to use my new smallish black and red bowls as side bowls and arrange the vegetables as a sashimi. Second, the theme for Bento Challenge this week is “Self Portrait”, and being a comic lover and sometimes cartoonist, I couldn’t pass this up. 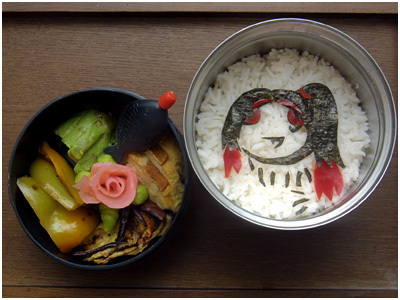 So the rice box has a selfportrait of the Were Rabbit in Nori and bell pepper shaves. Beware the fangs! I cut the nori and bell pepper by hand with kitchen scissors, from memory of an earlier self portrait design I had drawn (This time, it’s less Powerpuffy – yay!). Yes, I am that crazy and cut stuff in nori without any pre-sketching. Don’t try this at home, kids!